The exhilaration of time stems from its absolute infinity. It is the epitome of the elegance of time. The purest expression of time, with no superfluous ornamentation, yet devoid of austerity. With an innate elegance over which time has no hold it revels in the spontaneity of the passing hours. "It" Is the new finely crafted watch from Badollet: Ivresse. Beneath an apparently understated air lies an uncompromising personality. The gentle curves and softened angles of the rectangular platinum case enfold the wrist in a warm embrace. Its finishes radiate a deep and intense purity that highlight its midnight blue face. The play on contrasts is heightened by the brushed finish of the dial set against the circular satin-brushed chapter ring. The latter appears to be literally suspended thanks to striking light and shadow effects, while the discreetly cut-out hands accompany time in its perpetually renewed cycle. The design, pared down to its most obvious and natural expression, celebrates functionality and readability rather than aesthetic excess, as the Badollet griffin appears in solitary splendour at 12 o’clock. 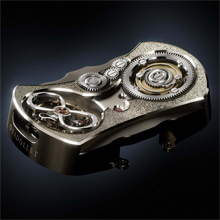 The aesthetic refinement, created by Eric Giroud, is equalled only by the mechanical complexity of this timepiece. 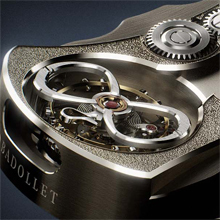 The flying tourbillon movement, exclusively designed and developed for Badollet, is deliberately hidden from sight. Visible only through the transparent case-back, the tourbillon carriage recaptures the delicate modesty of vintage watches. 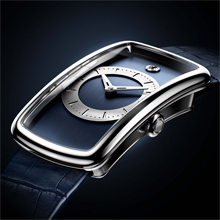 The sapphire opening is shaped like the symbol of infinity, in a tribute to time as the universal driving force. Elusive, yet perceptible, immutable and yet exhilarating. In a 21st century fascinated by disorder and the ephemeral, equilibrium is the exception. The fine balance epitomised by this timepiece, Ivresse, represents an art of living favoured only by those who prefer authenticity to frivolous exuberance. Dimensions: Length   35.00 mm. Width  19.50 mm. Thickness : 6.40  mm.